There will be a time when I don’t count the days from Darwin’s birth, just as I stopped counting the hours, but 14 days just isn’t long enough to grasp all the amazing changes she has brought to my life. I was expecting hard. Both my brother and I were severely colicky, as was my nephew. Many of the babies I’ve cared for over the years have cried inconsolably, and i don’t discount that we could still see that happen, but while waiting for the other shoe to drop, I’m going to bask in the glow of a very calm baby. So far I’m getting both more and better quality sleep than I did during my 3rd trimester. I’m grateful because I can’t imagine caring for an infant on 4 hours of broken sleep a night. I also feel a little smug in the face of everyone who responded to my statements that I wasn’t sleeping while heavily pregnant with comments about how much worse it was going to be once the baby was born. For all of you who are about to become parents – sleeplessness at some level is guaranteed, but it’s not necessarily going to be horrible. In fact (surprise surprise) is kind of wonderful to wake up in the middle of the night and see those big eyes peering at me, asking for me to comfort her. I’m apparently feeling a bit moony this morning. Anyway, amazing things at week 2: we’re well above her birth weight now. On Monday at our part partum appointment she was 7 lbs 15 oz, so I’m sure she’s in the 8 lb range at this point. No word from the metabolic screening folks, so we’re in the clear for the first half of the test. She dreams regularly and has cried and laughed during her dreams. She does not like getting the hiccups, but she doesn’t cry about it, just looks grumpy. Finally, she sleeps like a champ – 2 to 3 hour naps in the day, 2 to 3 night wakings for nursing and sometimes a diaper change. All I keep thinking about is something I said to my mom not long after we brought Darwin home: I didn’t know babies came like this. Greetings readers. I’ve just posted our birth story with some pictures. It is pretty personal and quite detailed so I’ve password protected it. Please e-mail me at littlerainbowbug@gmail.com for the password. When we found out last January that we would finally be expanding our family, one of the first things we did was to tell MamaLee’s major professor, because in addition to studying home birth, she is a spectacular home birth midwife. 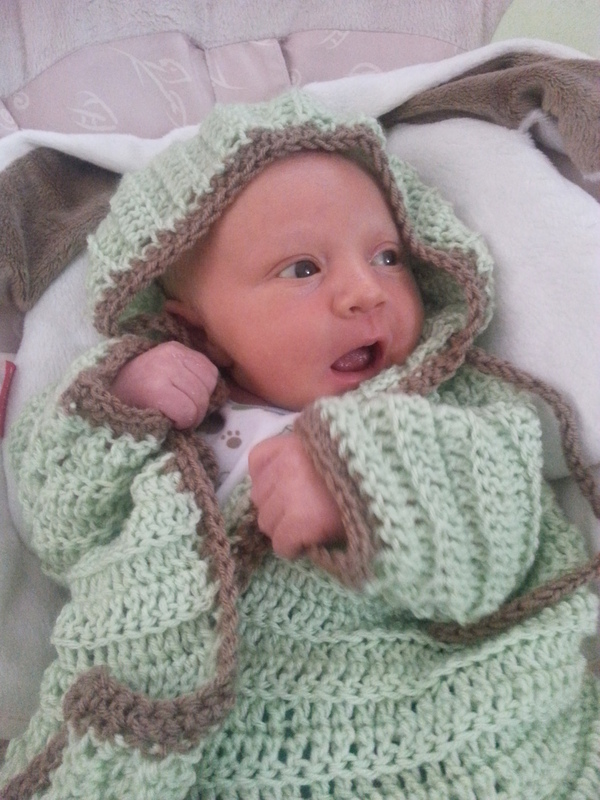 Plan A was set in motion: deliver our little Bug at home to limit stress and unnecessary interventions. Fast-forward to 40 weeks+1 day: Tuesday, September 9th. I was saving my maternity leave for after the Bug arrived, so had gone in to my office to continue working on a paper that I’d been preparing. At a few minutes before 11 am, I had a first crampy contraction. I had been having increasingly strong Braxton-Hicks for the past week and didn’t want to get my hopes up, but thought I’d start timing them just in case. I also told MamaLee, who had come into my office so she could get some job hunting done in town. Thank goodness for job hunting. Hoping to get things moving we walked a loaf of homemade bread over to my dad’s office and back; by about 12 pm I realized I was not going to be attending my 2 pm meeting. I sent a slew of e-mails I’d been meaning to send and we hopped in the car, contractions about 4 to 5 minutes apart and intensifying. Still, not so painful that we couldn’t stop and drop off one of MamaLee’s job applications on the way. I called midwife M on the way to let her know what was up. She asked that for early labor I be in contact with our other awesome midwife (B) who needs just a few more births for certification (or something, thinking back I was clearly already starting to enter laborland because this is where my memory starts to get fuzzy). We made it home with plans for some good solid pre-labor — rest, eat some snacks, play some video games… ha. MamaLee downloaded the old school Final Fantasy 3 and I proceeded to drape myself over my birth ball and hum through contractions. There would be no video games. My thought was something along the lines of ‘great! Let’s get to this, I’m ready to meet my little one on the outside!’ Little did I realize that the achy back I was beginning to experience belied that expectation. My parents came and my dad took our dog Scout, who had been quite attentive, while my mom settled in to help out. Our friend R, whom I wanted at the birth, also showed up. I bounced on the ball. B showed up at some point mid-afternoon and prepared everything. I was aware that she was there and bustling around, boiling water, setting up things in the nursery/birth room. MamaLee was amazing and provided counter pressure and rubbed my back because, oh yes, yes I was having full-on back labor. Contractions were every 2 to 3 minutes and I was humming and singing my way through them, which was apparently not typical. I just did what I could to make the pain bearable (it was surpassing my worst migraine pains at this point), make sounds that were productive and feel like I was creating a welcome for our little one all at once. At some point I ate a bowl of yogurt, which was the last thing I ate before the little Bug arrived. I think that was around 5 pm. I think I also ended throwing that up. Thank goodness I gained almost 40 lbs during my pregnancy, because the reserves were needed. M showed up around 7 according to MamaLee. I remember her arrival through a haze and had thought it was much earlier. We also had a student midwife, K, who I thought was the bees knees as well. She had showed up around the same time as B. My birth team was fricken awesome. As the night wore on my memories become more and more vague. I recall taking a shower and singing Unitarian Universalist songs through contractions. The shower felt good but was not soothing enough for the strength of my contractions. I got out and continued to labor on the bed in the nursery for what was apparently a long time. It got dark. At some point during this time the midwives did a check and I was at 5cm (I don’t actually remember being at 5 cm, but my mom filled me in). The Bug was also still on the right side and not rotating, so we started to try more calisthenics: squats off the side of the bed, belly lifts (oh my those hurt! ), but this little Bug was just not able to turn into a position that would move her down and out. I had been checked sometime after midnight, and was at 7 cm. At little before 4 am I took a long walk high-stepping down the driveway. When I got back inside the midwives talked to us about where we were. We had tried a lot and nothing was working. To top it off I was dehydrated from throwing up, and physically exhausted from almost 16 hours of back labor with contractions 3 minutes apart. I hadn’t eaten in about 12 hours. The good news was that the Bug was doing great with a steady heart rate. That meant if I wanted to try something else we could, but ‘something else’ meant more energy to try to turn her, and I was worried that I wouldn’t have any energy left to push her out. I had made it very clear throughout my pregnancy that my main goal was to have a vaginal birth, and that if it meant I needed to transfer to get rest and hydration at the hospital, I would do that. MamaLee and I talked, and she suggested we do a check to see if we had made any progress with all the energy that I had spent trying to turn the Bug. I agreed and a check was done. No progress in 4 hours: still at 7cm. I knew immediately it was time for Plan B: I was going to have to transfer now if I was going to have any chance of delivering this baby vaginally. I remember falling back against the bed and saying something like ‘Ok. I have to go.’ Everyone agreed and I think there was some significant relief that I had come to the decision myself. The midwives contacted the hospital and MamaLee got a bag packed for us. We had put together a diaper bag in case this happened but hadn’t managed to put one together for me. Oops. The walk to the car was hard; the drive to the hospital was bearable for me because I knew I was moving towards pain relief and the ability to sleep. It was more difficult for MamaLee because she had to drive while I vocalized through my contractions. At the hospital we checked in at the ER (pro check-in person was super fast and didn’t insist I sit in a wheel chair – big win for our local hospital). I walked and squatted through contractions to get to labor and delivery. A contraction hit hard while we were waiting for the elevator and I remember crawling into the elevator mid-contraction, aware primarily that the elevator would take me closer to relief from the damn back contractions. Once in the L&D room my first nurse, S, placed an IV very quickly to get saline started. Since epidurals can cause a drop in blood pressure they want to have a liter in before they place the epidural. I was also quite dehydrated. I remember S being fast and funny, but apparently I was not tracking well enough to hear the disparaging comments about home birth folks. I’m glad she went off duty before I was lucid enough to comprehend those comments because I would have been pissed. The epidural was placed by a fabulous anesthesiologist (Dr. G), in about 7 minutes. I remember that it was completed at 6:06 am. Relief was almost immediate. Apparently I told MamaLee to tell Dr. G that he was a good dude. I stand by that assessment fully. Over the next few hours (about 7 – 10:45 am) B proceeded to help maneuver me into a variety of positions supported by the bed in order to turn the baby. She also had me try a few practice pushes and used some other techniques to help shift the Bug. At quarter to eleven I started pushing. My epidural began to wear off enough at one point during pushing that I started to feel the contractions in my right side, and when one went into the right side of my back I panicked a bit. Everyone reminded me that I could press the button on the epidural to get an extra shot to cover break through pain, and that was the last contraction I felt in my back. I pushed for three-and-a-half hours. Once she descended into the birth canal I was able to reach down and feel her hair-covered head. That was surreal. The team brought over a mirror so I could watch her crowning, and apparently that made my pushes much more effective. She crowned for 26 minutes. At one point she had some late decels (low heart rate after a contraction, rather than during) and the OB suggested that we might need a vacuum extraction. Bug’s heart rate came back up; I kept pushing. When I could see almost her whole crown the OB said that she could do an episiotomy and the baby would come right out. I don’t remember if that was before or after I said (for the first time during this 27.5 hour process) that I couldn’t do it. If it was after, that suggestion lit a fire under me. I said “no!” and reached down, and tried to help the Bug out myself. This was my rock star moment. It was either that contraction or the next and she was out. MamaLee caught her and I helped pull her up to my chest. Darwin Hazel was here. I’m very pleased to share that Darwin Hazel was born on Wednesday afternoon at 2:35 pm after 27.5 hours of labor. This is the first I have been up for posting; it was a bit of a rough ride (although not so much for Dar, she was a champ and her heart rate was stellar almost the entire time, with a short exception while we worked through the pushing stage). 7lbs, 12 ounces put her about a full pound above our midwives estimates, and she’s in the 50th percentile across the board. I’ll post my version of her birth story sometime this weekend. Or week. And I’ll put up some photos once I figure out the password protect thing. I know I have no real place to be impatient– number one, I’m not the carrying parent, and really if anyone gets to complain about pregnancy taking F O R E V E R it should be MamaRae. Number two, we don’t hit 40 weeks until this next Monday, Sept 8. But I’m starting this new job, and I’ve been really anxious about not being available RIGHT AWAY when MamaRae goes into labor. Nevermind the fact that I’m still in orientation and training and so leaving early or calling in to miss a shift is not a huge deal. Nevermind the fact that I was completely up front with management at every stage of the hiring process, and every person I’ve talked to has been very supportive of my position. Nevermind the fact that labor doesn’t (usually) happen the way it’s shown on TV, all fast and furious (MamaRae plans to play video games through early labor. It’s ok if I miss the first 20 minutes of that). Nevermind any of those things, I’m anxious, and when I get anxious, logic doesn’t help. The only thing that will help is the removal of the stressor– in this case, either quitting the job (not an option) or the baby coming out (preferable!). So. I’m excited. I can’t wait to meet my baby. And I’m anxious and can’t wait for Bug to be born just so I can stop stressing out every time I go in to work. This morning we had what I hope (but am trying not to expect) was our last prenatal. Everything looks good to go and Bug has dropped a bit. The slight downside is that this little one has firmly shown a preference for my right side, which can mean a longer labor, but when I consider that we could be going into this with a footling breech, I have no real complaints! Most of the last few weeks has been about trying, and failing, to sleep more than two hours at a time, and getting as much work done as my sleep deprived brain can handle. Scout the dog has started acupuncture in the desperate hope that it will help her anxiety about the world, which manifests in destroying things and climbing into my lap. All 57 lbs. I wish we had thought about it months ago, but we will do what we can with what we’ve got! I never thought I would have a ten year old dog with as much energy as a typical puppy! We’re very grateful that she loves babies and are doing what we can to prepare her. Lots of exercise (which is great for me too) and more training time. Here’s hoping by this time next week I’m either in labor or I can already sleep on my stomach!